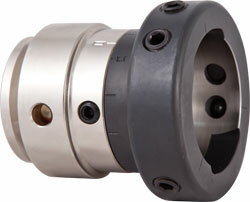 The Eccentric Chuck #2 allows you to turn off axis and will accept all the Eccentric Chuck accessories. This chuck comes with two parts, the insert pickup and the ball adaptor (balls are sold separately). The ball adaptor turns 360 degrees and the ball will swivel 15 degrees on the z axis. Please note: for insert type chuck, an appropriate VM120/150 insert is required to fit your lathe. Inserts available for most threads. Click here for the list of inserts. The Eccentric Chuck #2 with insert and optional ball pickup.